Sometimes copywriters say too much, going off on a tangent or introducing information that confuses the reader. In other cases, copywriters say too little, forcing the reader to make assumptions. When content creates boredom, confusion or uncertainty, landing page visitors have a hard time converting into customers. Avoiding these effects is harder than you may think, as we will see in the examples that follow. Value – Do the benefits speak to the target audience? Is the value strong enough to motivate a user to respond? Credibility – Will the user be confident that the seller is legitimate? 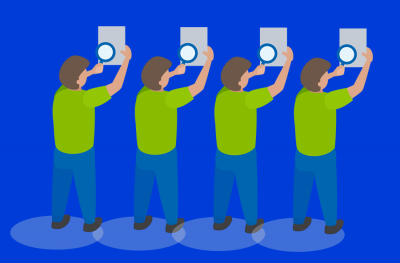 Authority – Will the user believe the seller is competent? Is the copy clear and concise, or does the message get tangled up in jargon and corporate-speak? Is the copy free of grammatical errors? Does the page have effective titles and subtitles? And since most users scan: Do the titles and subtitles inspire them to dig deeper into the content? 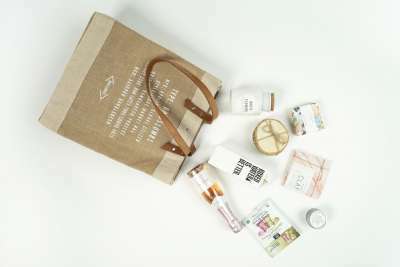 Do they encapsulate the key benefits of the product or service? Does the copy contain too much detail? Not enough? Are the calls to action appropriate and clearly explained? Remember, you want just one call to action, but you can place it one the page several times. Ideally, put one above the fold and after your offer. Is the content easily scannable? Do the layout and design enhance or detract from readability? If landing page copy performs well in all seven areas, it will convert. So put your focus on these areas when writing and optimizing your page. Let’s take a look at three landing page examples, two short-form and one long-form, and consider these various attributes in more detail. I’ll discuss issues with each landing page in order of importance. Overall, this landing page has taken brevity too far. The product, CPQ (configure price quote) software, is by nature technical and complicated. The firm relies on a 2:44 video to convey the key features and benefits of its product. Create value-rich proposals with upsell and cross-sell opportunities. Take your sales reps through a systematic process built on your sales strategy. These bullets give users an idea of what the product actually does, as well as hit themes of interest to sales managers—upsell, cross-sell, systematic process and strategy. As a side note, I’m not sure whether working within Salesforce is good or bad. Are firms that don’t use Salesforce still prospects? If so, the video message and my suggested third bullet point will deter non-Salesforce users from converting. On the other hand, if the product requires Salesforce, that information is a key benefit: Add value to your Salesforce CRM by adding our versatile CPQ software! Body text fonts could be larger and darker. The first subtitle, “Configure Price Quote – 30 Day Trial,” misses an opportunity to highlight a benefit. The benefit of speed was covered in the title, which is good, but why not use the subtitle to mention flexibility or mobile-enabled? The call to action, “a free 30-day trial,” may need more supporting information to persuade users to act. How many users do I get for my free trial? How complicated will it be for my staff to integrate the software with Salesforce? How much does it cost? A secondary call to action such as “Download our brochure” would improve conversions by appealing to users not ready to pull the trigger on a trial. One small precision issue bothers me: “30-Day” is hyphenated in the call to action block but “30 Day Trial” is unhyphenated in the subhead directly to the left and in the body copy. Would this flaw by itself deter me from converting? Maybe not; but combined with such thin information, it’s another strike against taking action. The body copy may be minimalistic, but it is also refreshingly free of jargon and corporate-speak—an all-too-common problem with software product content. This copy lays out the benefits in plain English and in a tone suitable for a corporate audience. Robust call analytics – How does that help me? Why does this matter? Purchase virtual numbers – What are virtual numbers? Is this an additional cost? An option? Optimize ad spending – I think I know what this means, but again, what is the value? Easy to get started – A benefit, but I haven’t heard any reason to get started. Affordable – A benefit, but I haven’t heard any reason to spend anything. Find out where your sales leads are coming from. Spend more money on the advertising channels that work. Spend less money on the ones that don’t. Get more leads, and get them faster. These bullet points, along with “Easy to get started” and “Affordable,” would make a much more persuasive header, because they are jargon-free, express benefits, and explain in a nutshell what the product does. The Step1, Step2 and Step3 content in the body may hinder rather than help clarity. If the target audience is small business (the video talks about a realtor), users are probably not familiar with virtual numbers and how the technical process works. Furthermore, they probably don’t care. 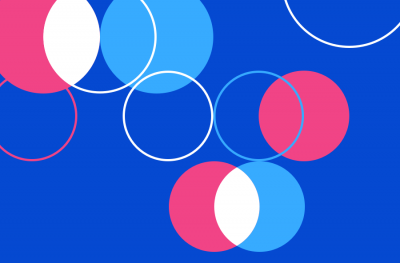 If users don’t get it, they feel stupid—which makes them less likely to convert. Why no space between the word and numeral in Step1, Step2, Step3? A small point perhaps, but combined with other shortcomings, this could be a fatal flaw. Why take chances? I assume the headline “Call Tracking” is dynamically generated to correspond to the search term used to find the landing page. This is good, because a relevant headline is critical to an effective landing page. However, the header design should include a static subhead conveying a key benefit, such as “Stop Wasting Money on Useless Advertising.” A strong benefit statement gives users a reason to investigate further or act. As with CallidusCloud, the call to action, “sign up for a free trial,” doesn’t provide enough information to elicit an easy “yes.” How long is the trial period? How does this product work with the advertising and phone numbers I already have in place? Bullet points addressing these issues would be a persuasive alternative to the “three step” copy discussed earlier. The secondary call to action, “read our case studies,” is good, but the CTA links to a page with 54 case studies! Definitely too much information for the user to absorb and probably not a pathway to many reads, let alone free trials. A much better option would be a PDF download with two or three killer case studies. CallFire could provide the download in exchange for user email addresses, enabling the firm to market to them in the future. The credibility logos are all large organizations, but the video uses an independent realtor. I’m confused: Does CallFire serve big guys or little guys… or both? When users are confused, they freeze. A simple statement such as, “We get results for entrepreneurs, Fortune 500 firms and everything in between,” would clear the confusion and generate conversions. The live chat feature is terrific. Users on this landing page are almost certain to have questions and many will prefer online chat to making a phone call. Live chat also enhances credibility by making the company look big. Readability is excellent: Fonts are large and have perfect contrast. With plenty of white space on the page, users will not feel overwhelmed. 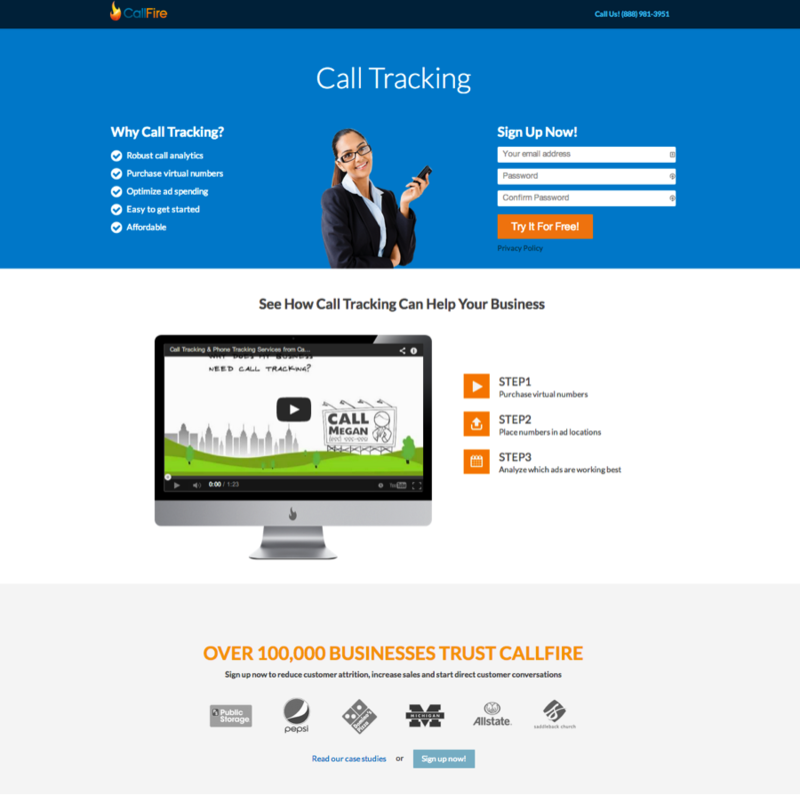 The statement “Over 100,000 Businesses Trust CallFire” enhances credibility. Users always like to know a product is widely accepted. This landing page has no glaring problems that I can see. That being the case, let’s start by running down the page’s good points. The header and subhead are chock-full of benefits: easy, no contracts, no cancellation fees. In a minimum number of words, great value is conveyed. The BBB accreditation symbol establishes credibility right off the bat. 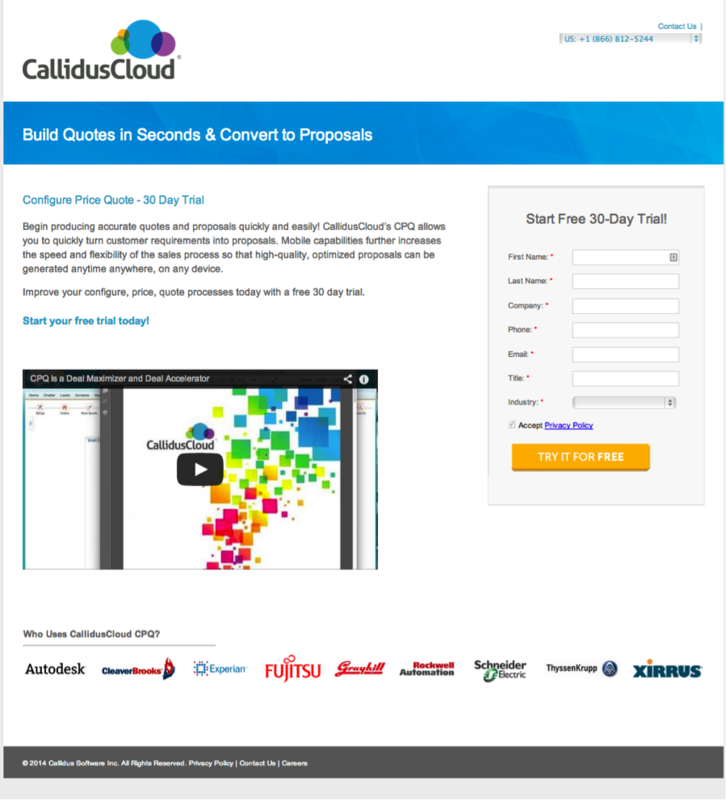 Repeating the “get quote” message at the top and bottom of the call to action block is persuasive. Too often, copywriters avoid repetition when, really, the object is to hit users over the head so they don’t have to think about what to do! The page is highly readable, with lots of white space, short bullet points, large subheads and sub-subheads, along with properly sized and styled fonts. Copywriters are sometimes too creative, shooting for copy that suggests credibility. Why not come right out and say it? Calling out reliability and transparency hits two notes that are sure to resonate with every user. Very well done. Note how the page leads with credibility and service before getting into product details. Excellent. For any financial services product, users must have trust in the company before doing business. Technical details about the product are few and far between. Instead, product benefits are stressed: flexible pricing, many software options, no long-term contracts, etc. Technical information gets in the way of conversion: It slows down comprehension and, as we’ve seen in the earlier examples, can raise doubts instead of easing them. The “Low Cost Guarantee” helps elicit an easy “yes.” On top of that, the call to action itself, “get a free quote,” is an easy “yes.” This firm is stacking the deck in its favor instead of putting obstacles in the way of conversion. In the Low Cost Guarantee section, we find the statement, “We don’t lure you in with the promise of a low rate you will never see.” But the very first bullet at the top of the page does exactly that: “Rates from 39%.” Only careful readers will notice this, but those who do may doubt the firm’s sincerity. Testimonials are usually great credibility elements, but here they fall short. The blank faces give users the impression the testimonials are made up; in addition, the statements themselves are confusingly worded. 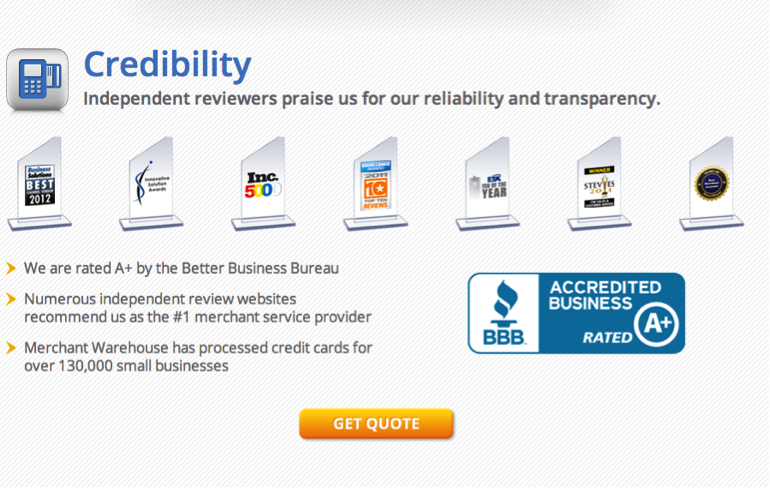 That a firm with over 130,000 satisfied customers doesn’t have stronger testimonials raises doubts. Client logos, also great credibility elements, are noticeably absent. Instead, we see seven logos of organizations that have presumably endorsed Merchant Warehouse. I can make out only the Inc. logo; the other six are unrecognizable. With no links to the endorsers’ sites or text listing the endorsers, it all seems a little vague. The last thing you want credibility elements to do is raise doubts, but here both the testimonials and these logos are drifting in that direction. The easiest way to improve the persuasive power of landing page content is to have the right person edit it. It’s difficult for copywriters to edit their own work, so editing by another is a must; however, if the wrong person edits it, the content will go from bad to worse. The editor should be familiar with the campaign strategy behind the landing page. The editor should also have a working knowledge of Web copywriting and CRO best practices. At our agency, project managers handle most of the editing. Another very helpful practice is to have outsiders from the target audience review the content. What is their reaction? Are they persuaded to convert, or are they bored, confused and uncertain? Note that agency and client personnel are far too familiar with the campaign strategy, product and value proposition to interpret content as a user would. Because they’ve been involved in strategy meetings and know what you’re trying to accomplish with the landing page, they can’t read it objectively. They may also take vital facts for granted and leave them out of the copy, or go overboard in their enthusiasm and write about them ad nauseam. Avoid these extremes and your landing page content will be well on its way to getting the job done. 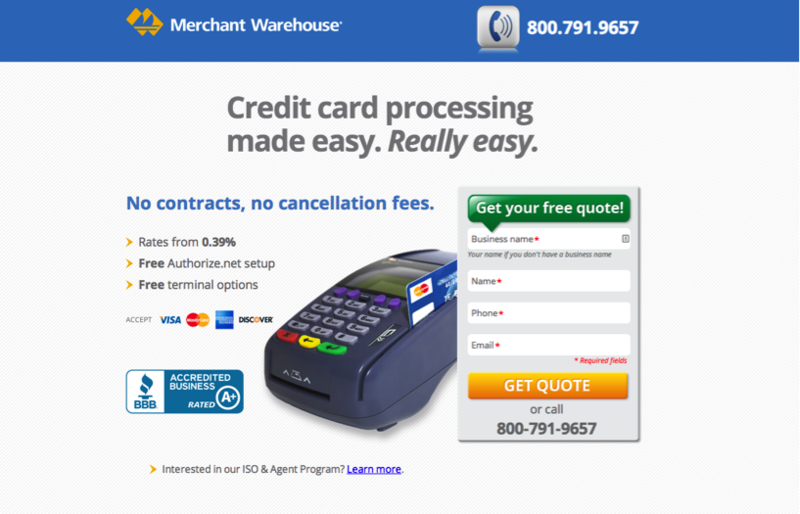 What is your biggest challenge in writing a persuasive landing page? Read other Crazy Egg articles by Brad Shorr.